The next time you buy beets make sure to store the stems in tupperware in your refridgerator. You can pop them in the microwave and eat them plain - they're really sweet and delicious. Each bunch of beets has a ton of stems and the store in the fridge quite nicely. I was making roasted asparagus last night and decided to toss some of the stems in while the dish roasted. 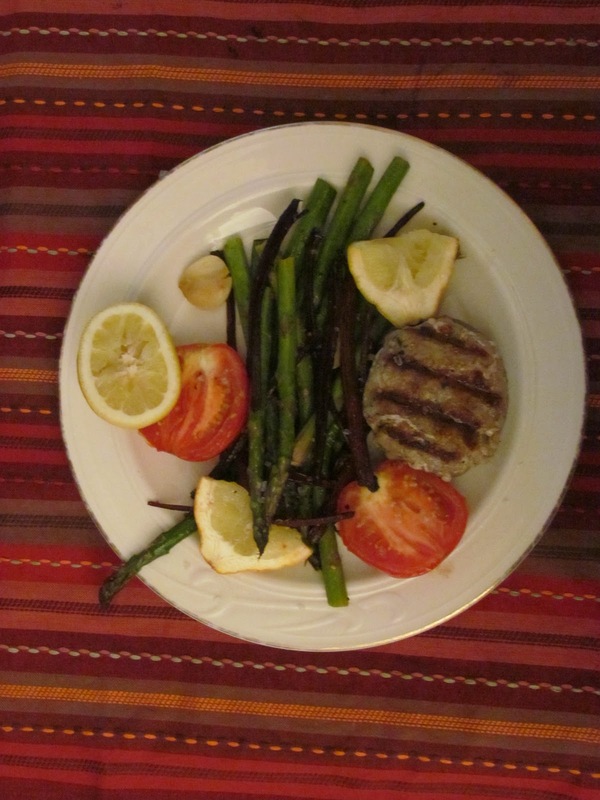 They offered a sweet contrast to the pungent asparagus - and it looked nice too! Try it next time you roast asaparagus, broccoli or brussel sprouts. 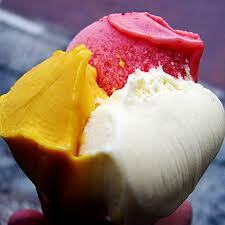 Sorbet and gelato have less than half the fat than ice cream. This is one of my favorites - raspberry and lemon sorbet. This is my first posting about dessert. I love to cook but I'm not a baker. With baking you have to be very precise with measurements or you end up with a disaster. Cooking is a lot freer. It's been difficult for me to write out recipes because I usually just do things by eyeing them - a pinch here, a dash there. On top of all that - I'm not really a cookies or cake person - my go-to dessert was always ice cream. Until that fateful trip to Napoli and I had my first gelato. Gelato is a lot denser than ice cream and the flavors more intense. Plus - gelato is lower in fat than ice cream. In fact, it has half the fat of ice cream - about 6 or 7 percent. Ice cream is 12 - 18% fat. To be considered ice cream in the USA it has to have at least 10% butter fat. 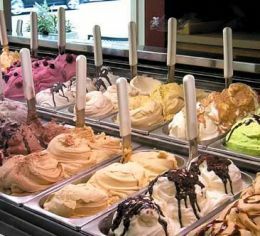 The fruit based gelatos have less than 1% fat. That's why gelato (which is Italian for ice cream) can't be called ice cream. So the next time you're looking for a tasty dessert mangia on gelato! It's healthier than ice cream and, in my humble opinion, offers much better texture and flavors. 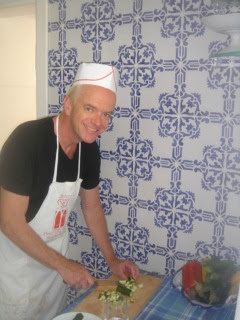 For lunch on Saturday I made one of my favorite sandwiches - tuna with peppers and low fat mayonaisse. 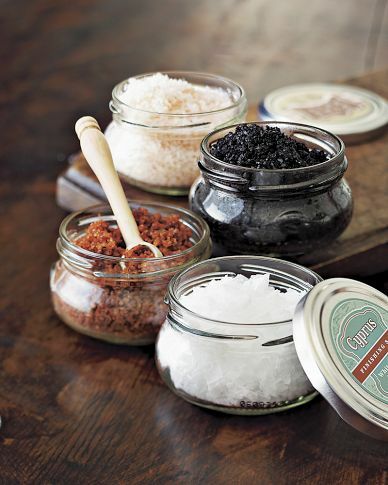 I already had a can of albacore tuna in the fridge - I keep it there so it's chilled when I'm ready to make a sandwich - here's the recipe: http://www.skinnygourmetguy.com/2011/06/whats-for-lunch.html. The brioche hero roll cost 79 cents. After lunch Hubbell and I headed out to Riverside Park - that's free entertainment! All in all a pretty inexpensive weekend - my out-of-pocket was under $10.00. I try to challenge myself to have "spend no money" days and inexpensive weekends - it's a fun competition. Living in one of the most expensive cities in the world, not spending a penny and still eating and living large. Try it! Steamed swordfish with capers, lemon and garlic with broccolini, celery root and beets. 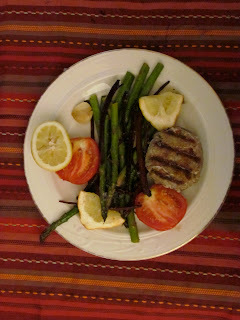 Last night I experimented with steaming swordfish instead of grilling as is my usual method. I don't think I've ever had my swordfish steamed. Well, I'm adding it to my repertoire because it's delicious! It's also very easy and your kitchen isn't left smelling of fish. Cover with the ingredients and steam for 12 minutes. Peel and cut the celery root into 1/2" x 1/2" squares. It cooks much faster then the beets. For the broccolini - I steamed it along with the swordfish for 5 minutes. After the broccolini was steamed I tossed it in with the celery root and garlic and gave it a quick sear. As usual, I seared the lemon with the other ingredients. I made a bed of the broccolini, celery root, lemon, garlic and beets. 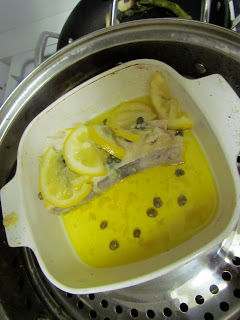 Place the steamed swordfish on top of the bed; I sprinkled with the Porcini Mushroom Sea Salt and freshly ground pepper. Serve swordfish on top of the bed. 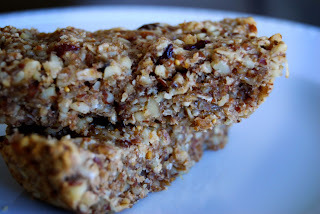 Making your own energy bars isn't difficult - and this recipe is delicious! Every Spring at the West Side Y there's a Spin-a-thon to raise money for the Strong Kids Campaign to send inner-city kids to camp. It lasts about 8 hours and people get sponsors to donate a certain amount of money per hour they spend spinning. For the uninitiated, spin is a class on a stationary bike. Before I took spin I thought it was a class where you spun around, which seemed rather pointless and thinking about it made me dizzy. The classes typically last for 45 minutes to an hour and simulate a ride on a real bike covering all sorts of different terraines, from flat roads where you focus on speed, or mountains where the resistance is extremely high and you try to go fast but it's difficult. 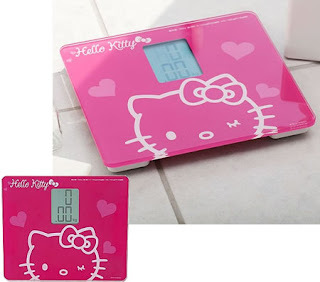 I wear a heart rate monitor that tells you how many beats per minute your heart is going and at the end it calculates your highest heart rate, the average and how many calories you've burned. My heart rate usually maxes out at 170, averages around 140 and I usually burn between 500 and 600 calories in a 45 minute class. On Saturdays I take two classes in a row an rack up1,100 to 1,200 carlories. Pass the cheese cake! But I digress - the Spin-a-thon is a fun event for a good cause. There are door prizes (this year I won a pair of footies with De-Feet written on them), a variety of instructors and this year Linda, one of my favorite spin teachers, made delicious energy bars. They were so much better than the ones you buy at the store. Linda is at center in the pink shirt with the black and white stripes. That's me in the red tank top looking like I'm about to keel over! I'm a whiz at preparing savory dishes but sweets and desserts aren't my thing at all. But even I could do this recipe - so give it a shot and let me know how it goes! Preheat oven to 350 degrees F. In a medium bowl, whisk together the oats, flour, wheat germ, cinnamon, and salt. In another bowl, whisk together the honey, applesauce, oil, and eggs until well combined. Stir in the oatmeal mixture until well combined. 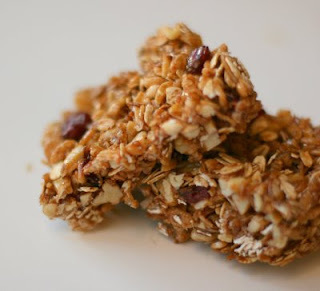 Add the dried cherries and walnuts. epared pan and bake until a toothpick inserted in the center comes out clean, 30 to 35 minutes. Put the preserves in a small saucepan and bring to a boil. As soon as the bars come out of the oven, brush with the preserves. Cool completely and cut into bars. Baked not fried - but you'd never know it! My friend Chef Bobo is passionate about healthy eating. 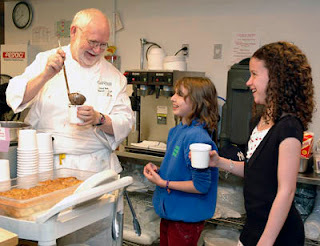 He is the Executive Chef and Food Service Director at the Calhoun School in Manhattan. He is commited to introducing food that appeals to the children at his school﻿ and to instill healthy eating habits that will stay with them throughout their lives. Chef was even a guest of Michelle Obama at the White House garden. There's a garden on the rooftop of the Calhoun School and Chef uses fresh herbs and other produce grown there to serve the students at lunch. He told me about a popular favorite at the school: Cajun Catfish. I cooked it last night. Not only is it easy to prepare - it's delicious! And economical - the piece I used last night cost $2.50. First you marinate catfish in buttermilk with a teaspoon of Tabasco Sauce. I marinated it for about an hour. I found low fat buttermilk. Next assemble the dry ingredients (complete recipe below). When the dry ingredients are assembled add oil so it becomes a paste. Slather the paste on both sides of the filet - pressing down to be sure the mixture sticks. The recipe calls for spraying a non-stick pan with Pam or equivalent cooking spray. I was out of cooking spray and rubbed canola oil along the bottom of the pan with a paper towel (the recipe calls for safflower oil which I didn't have either. Safflower oil is very healthy and is worth finding). I flipped the filet over about half way through so both sides would be golden brown. I topped with sliced lemons and popped it back in the oven while I set the table. One of our chef’s at Calhoun, Ilya Malachias, introduced this fish entrée when I was asking the chefs to exploring “oven frying” fish and chicken instead of deep frying. This catfish dish was such a hit! Flavorful and crispy, serve it with the tarragon tartar sauce and a little squeeze of fresh lemon. Chef Bobo with students at the Calhoun School. Gaudi devoted his last years to the project and at the time of his death in 1926, less than a quarter of the project was complete. Construction of the basilica has faced many hurdles over the years. 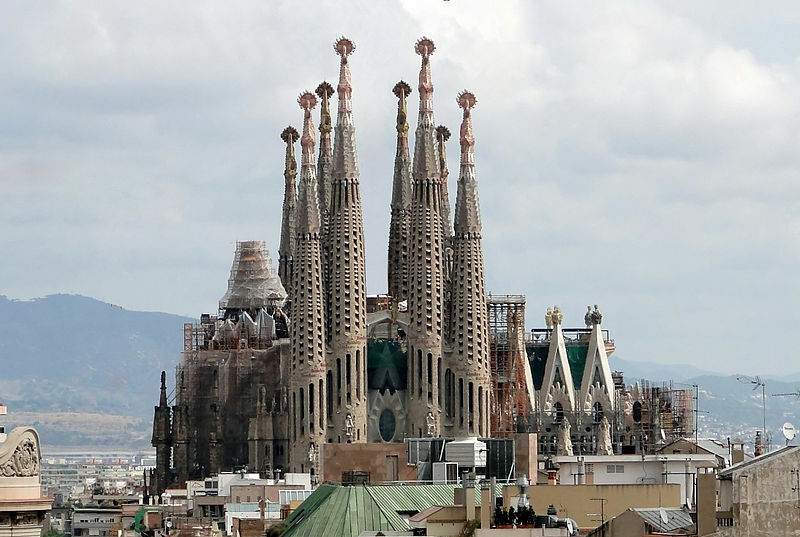 Construction was interrupted by the Spanish Civil was, only to resume intermittent work in the 1950's. 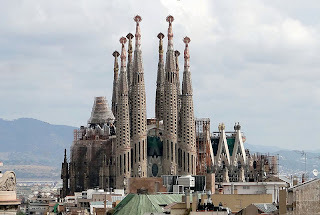 Even though the Sagrada Familia is far from finished, the remarkable church is well worth a visit. You can visit the crypt where Gaudi is buried. ﻿There's a museum that tells the story of this great architect and the history of the church. An elevator takes you to the top of a tower where you have a magnificent view of Barcelona - not recommended for those with fear of heights! When I started this blog my main focus was on the Mediterranean diet and coming up with recipes that are easy to make, pleasing to the eye, delicious and help with weight loss, or at least maintaining a lean physique. That hasn't changed. 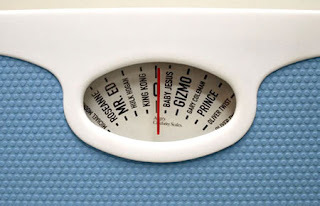 But along the way in experimenting with different foods to accomplish these goals, I've found that, not only have I lost weight, but I feel better than I have in years. 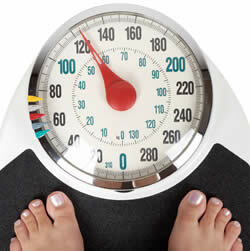 Eating healthy does more than help you reduce your waistline - it makes you look and feel better. Friends are saying I'm looking really healthy these days. I'm off coffee in the morning and have fresh squeezed juice, usually grapefruit juice, in the morning. And, among other things, I'm eating more beets. Don't toss the leaves and stems - they're delicious! I've always liked beets, but it freaked me out a bit they way it turns urine a pinkish, reddish color. Now I just look at it this way - the beets are doing their job of getting through your entire body. They detoxify the liver. They help lower chloresterol. They're even used to treat and prevent certain cancers. It's believed ﻿that Russians owe their good health and longevity to using beets a lot in cooking - especially soups. Technically, raw beets are the best for you as cooking reduces some of their nutrients. But there are still plenty of benefits left when you cook them. I cut the stems and leaves off first and set aside. I put the beets in a casserole pan and put in a 350 degree, pre-heated oven. Depending upon how many beets you have and how big they are, I roast them for at least an hour. Last night I had a large amount of beets and roasted at 300 degrees for 90 minutes. As your beets are about 10 minutes or so from being done I start with the leaves. Yesterday I steamed the stems for about 5 minutes to make them tender. Then I stir fried chopped onions till they started to soften. I added chopped cherry tomatoes and garlic to the pan and swirled them around for a minute or so and then added the leaves. Just like spinach, they reduce considerably. ﻿﻿In the future I'll post about squeezed beet juice. This is the ultimate way to get the full health benefits of beets. You have to be careful to work your way up slowly with beet juice - and you shouldn't drink it without mixers. Beet, ginger, apple and celery are a great combination. Beets heat up nicely the day after - so they're good for leftovers. You can also slice them the next day and have them cold or at room temperature - mix with plain Greek yogurt - for a tasty snack or lunch.